After making some changes recommend by the Forest Service, these trips are going as planned. The Moose Lake Challenge commemorates the paddling route that the Voyageurs used back in the 1800's. The Moose Lake Challenge (MNML) and the Voyageurs Challenge (MNVC) share the same course, checkpoints, and ending date. They have very different starting points. The MNML starts further into the course to allow people with less time available to take part in these awesome events. The next Moose Lake Challenge is Monday, September 16, 2019. There is no equipment inspection for these events. There will be an informal dinner at the Chocolate Moose before the Minnesota Kruger Challenge. Dates and times will be announced by email prior to the events. If you can make it to MNKC and MNVC dinner, please join us. There will not be an official pre event dinner for the Moose Lake Challenge. The Moose Lake Challenge finishes on Sunday, September 22, 2019. Refer to the schedule for time/date specifics. MNML cost is $0.00 for the captain and $0.00 for a crew member if any. It does not include your BWCA permit or any optional outfitter fees for transport, rental, purchase and such. The group leader and anyone in the same canoe must be a WaterTriber and must pay the WaterTribe entrance fees. Membership in WaterTribe is optional for all other group members. Due to permitting requirements, we must be divided up into groups. Each group must have a group leader who is the permit holder. These permits must be acquired very early in the year before they are taken so it is recommended to get in early. Registration for ends Monday, July 08, 2019 at noon. It is suggested that you use Piragis as the permit issueing agency. Billing starts Saturday, June 01, 2019. The payment deadline for group members is Monday, July 08, 2019 at noon. Group members can receive a full refund up to the payment deadline. Due to the exteme commitment for this challenge late registration and/or late payments will not be allowed. We recommend that you commit to this trip early so you have plenty of time for planning, training, and preparation. Pay early in the payment cycle. You can receive a full refund up to the payment deadline. All WaterTribe events are dangerous events as defined by law and common sense. You are responsible for your own safety. You must read and understand the WaterTribe Rules and Warnings before you register for this event. Although the warnings read specific to Florida, they all apply to the northern Minnesota environment (except maybe alligators :) and must be read and understood for this event. The MNML distance is roughly 125 miles. We follow the Minnesota/Canadian border for the majority of this challenge. There are several portages and the 9-mile Grand Portage at the end is frosting on the cake. Be prepared and pack lite. The official time limit is 7 days but if necessary you can still rack up a finish with an additional 1 or 2 days. Note that the award ceremony is based on the 7-day finish. Although we mostly follow the Canadian/Minnesota border, you are not required to follow it. For example, the route selected using PaddlePlanner could take you south of the border for a ways. This is OK as long as you hit an OK at the virtual checkpoints. The route follows the Minnesota/Canada border. We need to stay on the Minnesota side as much as possible. But sometimes that isn't possible. Sometimes you will be paddling in Canadian water and sometimes there will be a portage on the Canadian side. Recently I was contacted by a non-WaterTriber named Mike who brought up some interesting points about travel in this area. I passed it on to BeaV to get his input. Here it is. As BeaV says, "This is a very important transportation route and both countries wanted to maintain unhindered access along this route. We are allowed to paddle on Canadian waters and portage on Canadian portages without passports, customs, or Quetico permits. The Key here is "travel". If you or I paddled north into a bay of a Canadian lake or went to shore for a snack or pee on Canadian ground, or decided to fish on the Canadian side, we would be subject to all the rules for crossing into a foreign country and their laws as it pertains to their fishing regulations, licenses, customs, Quetico or other parks permit, etc." BeaV continues, "Another thing to be aware of is Gunflint Lake area. We will be leaving the BWCA at Magnetic Lake just before the Gunflint and then reenter the BWCA at South Lake. Technically, per the Wilderness rules, once we leave the BWCA we would need to have a new Entry Permit to reenter the BWCA. However, the USFS has an unwritten rule that if we just travel across this area without stopping to camp or stop at the outfitters located on Gunflint Lake, an Entry Permit is not needed." I also saw something on a web site but I can't remember exactly which one it was. They mentioned that if you are forced ashore on the Canadian side due to extreme weather, that you would be OK. Just make sure you get back on the water as soon as it is safe and don't overdo it. I'm not a lawyer so don't blame me if you end up in jail. Groups are limited to 8 or 9 people and four kayaks or canoes. For example, three people in each of three canoes. Or two people in each of four kayaks. Or four people in four canoes. How you setup your group is up to you as long as you follow the overall guidelines of max 9 people and and max 4 boats. Also, note that most campsites work best with two or maybe three tents. This is another factor to consider when setting up your group. Each group must have a group leader who will be the permit holder for the group. When registering for this event, the group leader should register his or her entry first and give the group a Team Name. All other members of the group can register after that making sure to use the same Team Name. Group leaders should name alternate leaders when they get their permits. Group Leader: Must be a WaterTriber and must secure his or her own permit. The Group Leader shall select a Team Name that all members of his or her group will use when they register for this event. Anyone in the canoe with the Group leader must also be a WaterTriber. Group Member: Group members don't have to be WaterTribers. However, if one person in a canoe is a WaterTriber then anyone else in the same canoe must be a WaterTriber. WaterTribers will receive finishing awards and be listed in the results, record book, and Rogues Gallery. Non WaterTribers will have lots of fun but won't receive WaterTribe recognition. All transportation costs and costs for the award banquet will be shared equally by all. The Group Leader must have a working SPOT and must have a PLB attached to his or her lifejacket. A VHF radio is optional. Cell phone coverage is mostly non existant, but it is recommended to carry one just incase. Other members of the group are not required to have a PLB or SPOT. However, WaterTribe strongly suggests a PLB or SPOT be attached to the lifejacket of each group member. All camping equipment may be shared by the group or portion of the group. For example, a group of 8 people might have two tents and one or two camping stoves and so on. Note that most campsites can fit two or sometimes three tents. Stuff like dry suits, canoe decks, snake-bite kits, and other stuff more suitable for coastal saltwater and the Everglades are not required. Instead bear repellent and suitable canoeing equipment and clothing is suggested and up to the Group Leader. Remember that you will have a nine-mile portage at the end of this challenge. You want to pack as lite as possible but still have everything you need. The BWCA has rules about what can be carried and what can't. Keep all the above points in mind, and regard the WaterTribe Required equipment list as suggested. There are numerous equipment lists available for canoeing in this region. This is a difficult course of roughly 125 miles with several short but difficult portages. There is a 9-mile portage at the very end. We have allocated 7 days to finish before the award ceremony. If it takes a day to two longer, you will not be DQed. It might be possible to finish in 4 days if your group is really fast but don't count on it. And if the wind is out of the east, you will be cursing the whole way. The course follows the Voyageur route along the Canadian and Minnesota border. You must enter as a single or double or triple in Class 2. The sails we are used to using in class 1 are not allowed. You are allowed to use a "makeshift" sail that does not have any mechancal advantage like pulleys and such. For example, using a paddle or two and a poncho would be OK. Using a PAS, BSD or Flat Earth sail would not be allowed. And forget boat carts - they will not work and will be extra weight. 1, 2, 5, 6, 9, and 10. These maps are 1.5 inches per mile which is pretty good. But the sheets are larger than the McKenzie maps so they are not as convenient for actual navigation in the canoe. C1, 14, 31, 13, 29, 10, 9, 8, 26, 6, 4, 2, 1, 98. They are listed in order from West to East. These charts are very high resolution at 2 inches per mile. They have 20 foot contours in the US and 50 foot contours in Canada. C1 may or may not be necessary. It covers Crane Lake which is an easy route and can be copied off of a Google Earth page if you want. You may or may not want to buy both sets of maps. It's up to you. Many thanks to BeaV for providing this information. If you haven't done a lot of portaging before, you might want to get a copy of the Boundary Waters Journal Summer 2015 and read the article on portaging about 20 time or so. It will help a lot. I wish I had done that before the MNVC2015. Challenge - Monday, September 16, 2019 to Sunday, September 22, 2019. There will be one official dinner meeting prior to the start of the MNKC. There is not an official pre event dinner for the MNML event although all participants are welcome at the MNKC dinner. Other meetings can be arranged by the group leaders. Note that the group leader can setup different shuttle times and arrangements if necessary. It is the responsability of the group leaders to arrange shuttle and launch times for their group. Ride back to Ely. The group leaders must make their own arrangements. Check with Chief because shuttle rides may already be available. The start is at Moose Lake EP 25, Minnesota. CP1 is at campsite 1281 and is a virtual CP. You must hit your SPOT OK Message. You do not have to camp or stop here. CP2 at campsite 2065 is a virtual CP. You must hit your SPOT OK Message. You do not have to camp or stop here. CP3 is at the start of the Grand Portage and is a virtual CP. You must hit your SPOT OK Message. There is no deadline for this CP we just want to know when you start the portage. You do not have to camp or stop here. 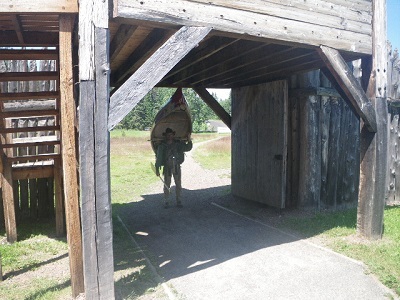 There is a 9-mile portage at the end of this challenge that finishes at the Grand Portage National Monument. The following image is an overview. The trail is pretty rugged. Here is a picture that shows what it will look like when you finish. The award brunch will be on Sunday at roughly 10:00 AM at the casino. This is followed immediately by the shuttle back to Ely. Note that there are two official finishing points for this challenge due to the absolute pickup time for the shuttle back to Ely. The finish point shown above is what you should be aiming for. If you can get to the fort any time on Saturday, you should do that. But if you can't make it to the fort on Saturday, then you should at least make it to the first intersection of an access road and the Grand Portage trail. This is roughly 3.5 miles into the portage. The race manager will pick you up at that intersection if necessary. You will still get credit for finishing the challenge, but you won't get the coveted sash. Important: If you can't get to the first intersection pickup point and you can't get to the fort in time for the shuttle, you will have to find you own way back to Ely. The shuttle is on a very tight schedule and must leave Sunday morning.